Make sure you’re wearing socks on the 21st because these poets will knock ’em off! 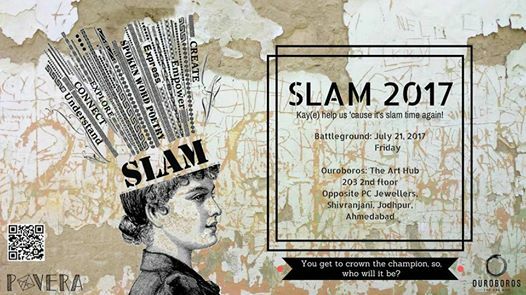 Come witness, cheer, and connect with Ahmedabad’s finest spoken word poets as they battle their magic (and metaphors) out for the title of being the best. A poetry slam is a competition at which poets perform original work, all to woo the audience because you’re going to judge who takes the cake at the end of the night. If you like snorting words and verses, this is one evening you’ll regret spending otherwise.